I am a sucker for all things makeup. I love trying out new products. It never gets old for me. So it was with great pleasure that I tried out Tocca’s Aqua Baci di Salina lip gloss. Tocca is known worldwide for their products and the lip gloss line is one of the newer offerings. 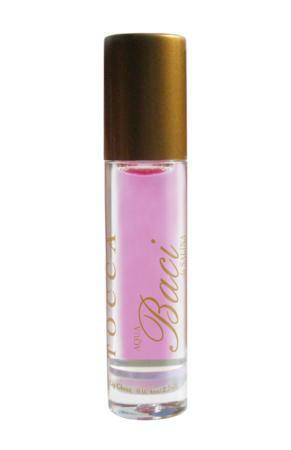 The Aqua Baci lip gloss is available in 3 flavors: Amalfi (apple lemon), Catania (sweet sugar vanilla), and Salina (raspberry peach). I tried out the Salina and I loved it. A deciding factor for me, in whether I use a lip gloss repeatedly, is how it feels on my lips. I hate glosses that make my lips feel coated with it and greasy. I like light flavors that moisturize my lips without my being aware every second that I’m wearing lip gloss. That being said, Aqua Baci di Salina is very light. It goes on with a rollerball, which means that globs of it doesn’t come off on my face. I can choose to put just a touch on or roll over my lips a few times for more color. The smell is gentle enough to not be overpowering but nice enough to remind me that I’m a girl and I get to wear pretty- smelling lip glosses. I’ve been wearing it for a few weeks now and I usually have to reapply after lunch but it doesn’t fade quickly off my lips. At $14, its pretty affordable. If you’d like to give it a whirl, click here or check it out on Tocca’s site.